Generator Services by City Oil Co. Inc. - City Oil Co. Inc.
We’ve heard it time and time again blasted on the television, radio and internet, that we have to be prepared when it comes to any kind of power outage, and it may not sound like a big deal when nothing is going on, but letting a stand-by generator sit partially filled with fuel or completely empty may cause big problems when an emergency or other unexpected dilemmas occur. Depending on the generator usage, for regular, intermittent, or emergency operations, home, or business, keeping control of fuel is of the utmost importance. Proper fuel levels need to be maintained on a regular basis. Keeping a generator supplied with fuel should not be an afterthought. Many times topping off a generator doesn’t seem like a big of a deal, and we’ll get around to it when the time is right, but when a storm, or natural disaster hits, delays with refueling could turn into an emergency situation. We can never be too careful when it comes to maintaining fuel levels for a generator, or take it for granted for that matter, as it may be a saving grace when an emergency occurs, or a major outage happens without a return of utility services for days on end. Keeping a generator topped off doesn’t have to mean running to a gas station every time there is a need for fuel. 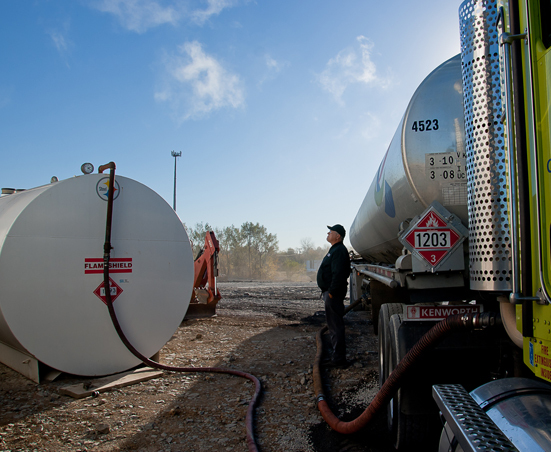 There are fuel services in Connecticut to help make refueling an easy and painless process, and City Oil is a regional supplier of gasoline, diesel fuel, heating oil and kerosene in Connecticut that can meet all fuel delivery needs. There is no need to be kept from a hectic work or activity schedule for the refueling of a generator. City Oil can bring it directly to a customer, whether it’s on a personal or business level. City Oil has supplied generator refueling services in Connecticut for over 25 years and has met the needs of various customers throughout the region. Expert delivery technicians can get fuel to a generator without delays. With an arsenal trucks tanks and equipment, City Oil is right on the mark in the region, as each and every stop to refuel a generator is a priority. Reliability and round-the-clock service, seven days a week, are all part of standard operating procedure with City Oil. They follow through to meet customer needs. Other companies may not be able to come close to those capabilities, but City Oil is there to take up the slack and help in a pinch with customer fuel needs, whether the delivery is an emergency or a routine stop. Fuel delivery for generator use is not a complicated procedure. In fact, it is a simple one when it is arranged through a supplier like us here at City Oil. All that is necessary is to make contact with the company. At City Oil, we have made it easy for fuel delivery for generator use to become a regular routine for those who need to refuel their generators on a regular or even irregular basis. Customers have access to City Oil services through phone or a website contact form that can be easily filled out and completed to arrange for delivery services. With all day and night service availability, arrangements can be made for deliveries early in the morning or late at night. No time of day is out of bounds for City Oil, as they are ready to make sure that a generator is filled, no matter the situation. If a Connecticut customer is desperately low on fuel, City Oil can be there to fill a generator as soon as possible. Look to City Oil for fuel replenishing needs, and if questions come up concerning a refilling delivery schedule, give them a call at 800.581.0000 or fill out the simple form we have provided on our website down below, and a representative will get back to answer any questions or set up a delivery schedule. There is no time like the present to be prepared for the day when a freshly filled generator becomes a whole lot more than just an occasional standby power.